If you're looking for excuses not to travel, they can be pretty easy to find. It's too expensive, it's too dangerous, it's too difficult. But they're all just that – excuses. Here are nine international travel tips that can help you overcome your objections to leaving your home country. Tip 1: Protect yourself against travel sickness. 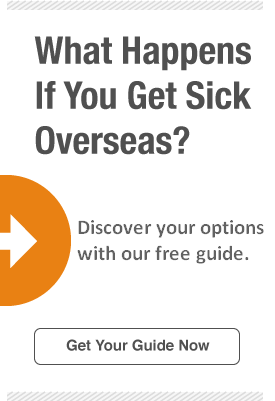 Sickness can occur when you're abroad but you can protect yourself in several ways: getting all the proper vaccinations, knowing how to get medical help abroad, and making sure your medical insurance covers you outside the U.S. Some countries will require you to carry an International Certificate of Vaccination (also known as a "Yellow Card") or other proof that you've been inoculated or gotten certain medical tests before you enter or leave the country, according to the U.S. Department of State. There are plenty of resources where you can get information about what vaccinations you should get, such as the U.S. Centers for Disease Control and Prevention and the World Health Organization. Visit this U.S. State Department page to learn about getting help for a medical emergency abroad. You should make sure that your current medical insurance covers you outside the United States; there's a good chance that your insurance does not, so you'll want to look into travel medical insurance. Tip 2: Outsmart pickpockets by taking some precautions. You can take precautions to outsmart pickpockets, who often work on subways or near tourist attractions. First of all, you want to avoid attracting unnecessary attention to yourself, so leave your expensive jewelry, t-shirts with American sports logos, and fancy clothes at home. You should also make photocopies of all your key documents. Travel guru Rick Steves also recommends wearing a money belt, leaving valuables in your hotel room (most rooms have safes), staying vigilant in crowds, and establishing a "don't lose it" discipline to make sure you don't leave things behind. Tip 3: Save money by taking advantage of budget travel resources. Travel is all about the choices you make. If you insist on staying in posh accommodations and eating at fancy restaurants, then travel can become expensive in many cases. However, you have all kinds of travel resources at your fingertips – from print guides to websites like Lonely Planet to online tips from travel experts – that can help you travel on a budget anywhere you care to go. There's also a new breed of companies that serve as an alternative to traditional travel booking services. If you're looking for alternatives to traditional travel accommodations, check out Airbnb, a website where you can browse and rent unique places to stay from local hosts in more than 190 countries. Two other alternative booking resources are Skyscanner; a travel search engine where you can book international flights, hotels and car rentals, and Hotels, a site where you can book hotels, bed and breakfasts, apartments and resorts worldwide. Tip 4: Read up before you leave home to minimize the challenges of travel logistics. Plan ahead in your method of travel, lodging, money, and sightseeing to keep your trip running smoothly. Read some print travel guides and online travel tips before you leave home to learn about the geography, culture and tourist attractions of your destination so you'll have a better idea of what to expect and can plan accordingly. When it comes to foreign currencies, you can save money using ATMs for your day-to-day funds. However, some ATM transactions involve fees that cancel out any potential savings; there are ways to avoid these fees, including knowing which foreign banks your U.S. bank partners with. Rick Steves advises travelers headed to Europe not to buy foreign currency in advance , as you're likely to deal with lousy exchange rates while stateside. Instead, get some foreign currency at an airport ATM. He also says to avoid, or at least minimize cash exchange because you can lose around 15 percent at currency exchange booths like Forex or Travelex; if you must change cash in Europe, postal banks inside post offices usually have the best rates, Steves says. You can also bring your credit cards with you abroad. However, you'll want to contact your credit card company before you leave home to find out what they charge for international transactions and make sure your card will work overseas. Some credit card issuers will charge you anywhere from 1 to 3 percent of the total transaction, while a handful simply charge a flat fee for each purchase, according to USA Today. Keep in mind that your payment-processing network like Visa or MasterCard may charge an additional, separate fee. Some foreign vendors may offer to run your purchase through as U.S. dollars, but this "dynamic currency conversion" usually involves high exchange rates and hidden fees, according to USA Today. Tip 5: Visit the local tourism office when you arrive. Travel blogger Nomadic Matt says a visit to the tourism office is a must because they know everything that's going on in the area, and can point you to free activities, special events and more. Tip 6: Avoid the longest lines at popular attractions by buying tickets with a timed admission, or arriving before or after the rush. If you want to visit the Eiffel Tower, the Sistine Chapel or the galleries in Florence, timing is everything when it comes to avoiding long lines. You can often avoid the throngs of tourists by going early or late, or by buying advance tickets that guarantee admission at a certain time, Steves writes. Tip 7: If you don't speak the language, learn a few important phrases before you leave home. You may not be fluent in the language spoken in your destination country, but it's awfully useful to learn some key phrases like "Please," "Thank you," "Excuse me" and "Where is the bathroom?" before you leave home. Then use those phrases when in your travels, even if you feel subconscious; you'll find that the locals will appreciate that you're making an effort to communicate and will be more willing to help you. It might also come in handy to familiarize yourself with the local cuisine ahead of time to make ordering at restuarants easier. Don't get rattled when trying to get your point across, even if you're in a bind. You can use gestures to get your point across, or even a simple phrase that's internationally understood such as " auto kaput" when your vehicle breaks down. Tip 8: Don't pack too much. Some people are reluctant to travel because they think they'll miss some of the conveniences of home. When they do leave home, they overpack and then must haul heavy suitcases and bags everywhere they go. Pack light rather than filling your suitcase to the brim. That makes it easier to get around and leaves you room to add in some souvenirs. You can also save space and weight in your bags by wearing your heaviest clothes, including shoes, on the plane. Tip 9: Stay aware of your surroundings and trust your gut instincts. Many people are afraid to travel alone, but the truth is you should be fine, even if you're traveling alone, as long as you stay aware of what's going on around you and trust your gut instincts. If your gut is telling you to avoid a certain situation, then avoid it. Fear of the unknown keeps many people from taking international trips, but international travel is nothing to fear if you take precautions. In addition to the tips above, make sure someone you trust always knows your location, pack and dress modestly, and make sure you're insured when you get off the plane.